When I read the passage from either Daniel or from Luke where the Angel Gabriel appears, I always think of the other one. Especially Luke, but they both always come to mind for me, and I think Luke meant for it that way (or better yet, The Holy Spirit who inspired Luke meant for it). His statement, “I stand in the presence of God….” always strikes me. It echoes in my soul sometimes unexpectedly. I might not read from Luke 1 for many months, and maybe I am just walking along the sidewalk looking at a flower on a random Tuesday afternoon when I am struck by that statement again from out of the blue. I think we could exhaust ourselves chasing that question. Zechariah is in the Holy Place when he sees Gabriel. They are both in the presence of God already, and so saying it is like overstating the obvious. But somehow it needs stated, and somehow it explains who Gabriel is. And somehow it gives even more reverence to the Holy Place than we were giving it before he says it. And that is just the tip of the iceberg of things we might say. Just the tip! Over the course of many weeks recently, I have offered posts detailing my friends and partners in ministry Agent Mamma DJ and Agent V. I told about blessings and hardships – and even the blending together of them. I told about how these ladies ministered to the homeless woman with the dogs in the park, also about my blessing and ministry to them, and about the hope for the future they are working for so hard, and about walking two hours to get to work at a minimum wage job. And then last week, Agent V went to jail when her past caught up with her. As I recall, one of the sentences I penned, a sentence that haunted me after I penned it: Desperation hunts her around every corner (or something like that). Well, desperation caught her and sank its teeth into her soul. And then I shared that story and put out the call for help – including prayers. And I had hoped that the comment page there would fill up with prayers for the ladies, and that they would read them and sense the LOVE of Jesus hunting them down behind every corner! But the comment page only got a trickle. And yes, I wrote about sharing the financial burden with them. I even floated out the number $800, since that is the amount that would pay off their little rent-to-own camper/fixer-upper. And I generally resist talking about money in any positive light. I don’t like the stuff. It is not of God’s creation; it’s of this fallen world! And though it can bless, I really think there is a net loss in the big scheme of things, not a gain. But I did float the notion out there, and I was being respectful when I did it. But now the money is rolling in. And I stand in the presence of God! The sacrifice is deep, and I feel it. I am in awe of it. Two people, so far, answered the call, and between them, the story I have shared about Agents DJ and V is generating $500! Please think about this with me a minute. People drive past Agent V walking to work every day and don’t stop to care. Far more people don’t know these ladies than do, and far more of them still wouldn’t care if they did know them. I can say much the same for this blog and this ministry. We are no big deal here. We are a small fry operation that does not even afford an actual budget (nor do we want one). But stick with the ladies especially at this moment. Agents DJ and V found something worthwhile in this ministry as humble as it is, and they joined. 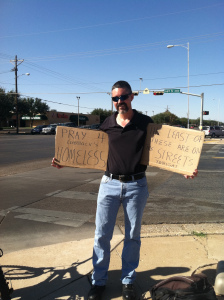 And they themselves are just about as humble as you can get in Lubbock, Texas and still have a roof over your head! If Jesus wanted to get the attention of Agent DJ and Agent V, he has now! And he had it already! There is a feeling of utter unworthiness, and I share it with them. $500! People aren’t just driving up to us on the street corner and handing that out!!! And it represents something deeply holy. We sense the blood, the sweat, the tears of labor and sacrifice that has gone into this gift! This money was EARNED by another and given freely so that we would have HOPE for SHALOM in our lives! When Moses found himself standing in the presence of God, he took off his shoes. For me, and I think I speak for Agents DJ and V as well, there is a thunder in my heart that makes me tremble to be included in this kindness. And my heart shouts for JOY and I say THANX! Thank YOU! Thank YOU, Jesus, and thank you brothers and sisters who give sacrificially of the treasures in your hearts. You are like Gabriel. A messenger from God with Good News!